Skywatcher VegaStar Carpentier took this photo of a waxing crescent moon in the early evening of Sept. 19 in St.-Cloud, Ile-de-France, France using a Canon EOS 1000D camera. A waxing crescent moon hangs above a hill in this beautiful night sky photo. This stunning image was taken by VegaStar Carpentier in the early evening of Sept. 19 in St.-Cloud, Ile-de-France, France using a Canon EOS 1000D camera. 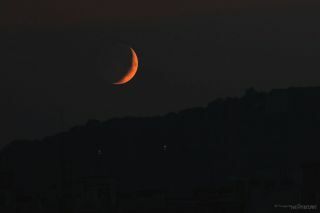 A crescent moon is part way between a half moon and a new moon, or between a new moon and a half moon. [Moon Phases Explained (Infographic)] The moon in this image is waxing at 15.8 percent of lunar illumination.